PhD in Pharmacy (specialty of Toxicology). She is an Assistant Professor of Pharmacology and Toxicology at Universidade Lusófona. Her main research interest is the potential therapeutic role of redox-active molecules, especially in the context of cancer treatment. She has several communications and publications, three international award and a national Honor. MSc, PhD in Human Physiology, he’s the founder and Director of CBIOS. He is the Director of the School of Health Sciences and Technologies and of the MSc in Pharmaceutical Sciences (Univ. Lusófona). Academic, mostly dedicated to skin physiology and pathophysiology research specially focusing quantification of skin properties, mathematical modeling of cutaneous variables, safety and efficacy trials. He has published more than 350 papers related with his interest areas. He is the founder and President of the Portuguese Society of Cosmetological Sciences (SPCC). Lecturer in virology, cell and molecular biology at ECTS – ULHT, where he also develops his research projects as a member of CBiOS. Nuno is an MSc in microbiology and molecular biology (from FC, Lisbon University), and a PhD in virology and cell biology (from Imperial College, London). His main research interest is tumorigenesis, focusing on the molecular mechanisms underlying metastization. Nuno has published work in molecular virology, apoptosis, Ca2+ homeostasis, membrane proteins, cell migration and adhesion. MSc in Pharmaceutical Sciences (FFUL), and PhD in Health Sciences – Pharmacy (Universidad de Alcalá). Lecturer in Pharmacology, Toxicology and Human Genetics at ECTS – ULHT. He is also a researcher at CBIOS. His research interests focus on cancer, mycotoxins and oxidative stress areas. He has several communications and publications in national and international peer-reviewed journals and meetings. 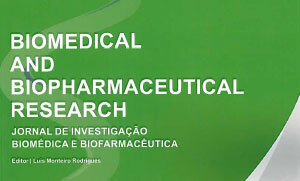 Pharmaceutical Sciences degree Faculty of Pharmacy University of Lisbon (FFUL), MSc in Health and Development and PhD in International Health with a specialization in Health Policies from the Institute of Hygiene and Tropical Medicine (IHMT) of NOVA University Lisbon. He is a Assistant Researcher at CBIOS Lusófona’s Research Center for Biosciences & Health Technologies.His research work focus on the use of Information Technologies (IT) to provide and improve health services in the context of primary and specialist health care. His current research interests lie in areas such as health services development, information and communication technologies applied in health service provision and capacity building of human resources for health. Current research interests are focus on non-invasive assessment of the autonomic nervous system, physiological vital functions and human movements. Extensive experience in development of different technologies for health information systems and therapeutical assessment. Several communications and publications in national and international peer-reviewed books, journals and meetings. Professor of Molecular Biology at Faculdade de Medicina Veterinária – Universidade Lusófona de Humanidades e Tecnologias. Graduated in Applied Chemistry / Biotechnology (FCT-UNL), MSc in Medical Parasitology (IHMT-UNL), PhD in Biomedical Sciences (UNL). She is author of several publications and communications in international and national peer-reviewed journals and meetings. Her principal interests are cancer molecular genetics, mainly canine lymphoma and mammary tumours, and molecular detection of vector-borne agents. PhD in Health Sciences, Assistant Professor at U Lusófona (School of Health Sciences & Technologies). Microcirculation is his main research area, from the development of physiological models to study its normal function and adaptation mechanisms, to the mathematical modelling of related quantitative descriptors. The non-invasive assessment of skin properties, within the so called experimental dermatology are also within his scope. His results have been presented in many communications around the world and published in international peer-reviewed journals.